My friend and fellow EQ enthusiast Shigenori Takekoshi runs a successful Project Management training company in Japan. He is teaching PMs about how to be more effective and how to leverage emotional intelligence. When Shigenori came to visit me last fall, ostensibly to learn about emotional intelligence for PMs from me, he taught me an important lesson about emotional intelligence. That is the ability to separate an incident, action or circumstance from my feelings about it. That is, he taught me that something happens, and then immediately after it I have a feeling about that something. The feeling I have is a result of both the thing that happened as well as my interpretation of the thing that happened. If we were to map it out, it might look like the diagram below. Situation, interpretation, then feeling. First we have the something that happens, the situation, circumstance, or event. Then we have our thoughts and interpretations of that situation, which will likely be unconscious. This is the filter through which we see the world. Finally, we have our feelings that result from the situation and our interpretation. The feeling may be sad, angry, scared, happy, excited or tender. This lesson from Shigenori was very helpful to me. It crystalized the concept in my mind. I had been very focused up to that point on the feelings but hadn’t spent as much time on the interpretation and situation. 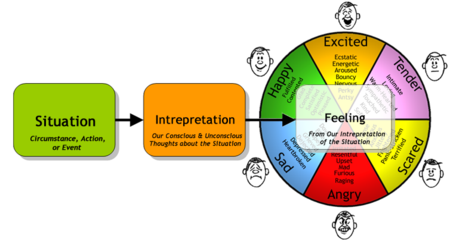 Feelings are still very relevant because they provide the starting point, the awareness or realization. Every emotion highlights for us that something is going on beneath the surface and in that sense, they provide great information. Remember that Peter Salovey said that all “emotion is information”. Consider the following example. How do you feel when it rains? Many people feel sad when it rains. It is usually dark and rain limits our outdoor activities. Think about how you would feel if you were a farmer with crops that need to be watered. You might feel happy and excited. Or if your house was in an area where wildfires were burning out of control, you might be happy to see rain. So our feelings about the situation are affected by our interpretation and our thoughts. By changing our interpretation of our situation, we can change our emotions. If we feel scared or angry about something, we can explore the thoughts and interpretations and change those so that we feel happy and excited. The challenge is that many of us are not aware of either the emotions or the thoughts and interpretations that led to those emotions. As a result, we create unnecessary sadness, fear or anger in our lives and in the lives of those around us. This particular event would fall in the category of cognitive disorder, specifically, filling in the blanks. Faced with a particular situation (no response from my colleague), I chose to fill in the blanks with a very negative interpretation of the situation. That led me to feel scared and sad. Imagine my relief a few days later when I did reach my colleague and he told me that his mother-in-law had passed away and he had been out of town. He liked my work and was excited to move forward. I was excited! Not that I was happy about the loss of life, but I was no longer filling in the blanks with my own interpretation of the situation. This is just one example of a phenomenom that goes on all the time with all of us. As I continue to learn about emotions and to get coaching and feedback from others, I see that these thoughts and interpretations of mine are more often my enemy than my friend. They are robbing me of joy and replacing it with anger, fear, and sadness. It is as if I have been programmed to be miserable. Fortunately, I am learning and growing and that empowers to me make the necessary shifts in awareness. I would love to hear your experience in this area. Cheers! Thanks very much Tony for your sharing your thoughts and feedback on my comment. First, regd. the lesson from Shigenori San, what he mentioned reminded me of a saying from Osho – aka Bhagwan Rajneesh, a spiritual leader. He has in one of his discourses mentioned an analogy between the sky and the clouds passing by. The clouds are akin to actions of an individual and the blue sky to the personality of the individual. Clouds come and go over the vast expanse of the sky which remains static. Similarily, the actions of a person are reactions towards situations but his core remains the same, like the sky beyond. He suggested not to focus on the actions and make our own meaning of them, but to look at the big picture, the individual’s overall personality and understand her/him thence. Why I brought this up is because when we ‘judge’ people or situations we make impromptu knee-jerk interpretations of them; this often comes from within us – in simpler words, our insecurity about something leads to our (mis)interpretations. and I am the common factor in all situations I find myself in; I react thus with one primary emotion that is strong with me. The rest of the emotions gets muted. Since then I have been in this state of awareness which switches on and off, but I have begun to realise the cause of things to some extent – all coming from within. But what basically overrides this process of awareness is the intense pressure of circumstances around, which basically make one doubt oneself more than before. – which often works against me I feel, ‘cos people around me take it as a victory of their power over me, that I have cowered away while I have made my own choice overcoming some negative internal emotion. The changing culture and the pressure of the globalization phenomenon has put intense pressure on people; and people (the white collar work force in general) here in this subcontinent, are generally not emotionally intelligent – though we are an emotional lot. thus make sharing a part of their personalities. Sharing surely opens up ones’ perspectives and the closed doors we tend to live in.